Seekkuge Prasanna during his stint with English county Northamptonshire. 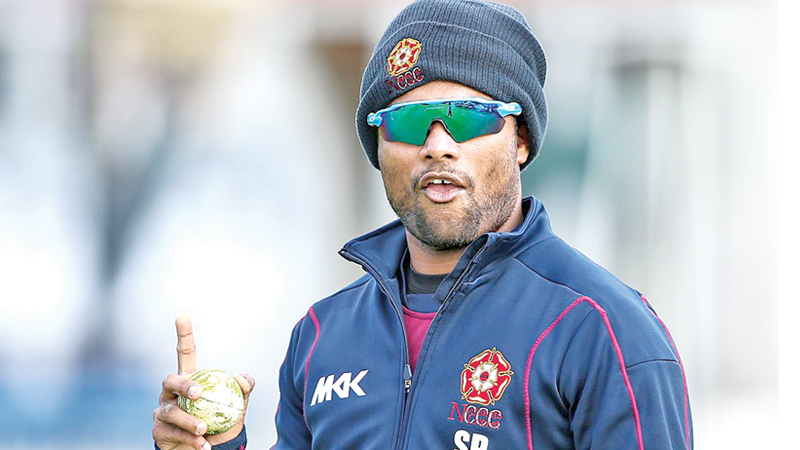 Seekkuge Prasanna’s two-year stint with English county Northamptonshire where he appeared for them in the T20 Blast could clinch him a place in Sri Lanka’s World Cup squad in England next year. Chief selector Ashantha de Mel said, “Actually the ODI squad for New Zealand was going to be only 15, but Sri Lanka Cricket said to send two extra players. Then we selected Seekkuge Prasanna and Dushmantha Chameera. We thought we look at Prasanna because he is the only other leg-spinner we have as (Jeffrey) Vandersay cannot bowl after his recent injury. “Prasanna is a seasoned campaigner he has performed in batting, fielding bowling and also he has been playing in England in the county circuit and has experience in English conditions. Since there was an extra place we thought we just take this guy and see,” said De Mel. Prasanna represented Northamptonshire in the 2016 campaign, where he played in 10 matches and took 12 wickets at an average of 24.00 with best bowling figures of 3-24 and an economy rate of 7.02. He was forced to miss Northants’ 2017 campaign because of a hamstring injury, but was back again in 2018 where he played in 13 matches and took 9 wickets at an average of 44.33 and an economy rate of 8.67. On the batting front De Mel blamed the preparation of poor batting pitches at home for the batting problems Sri Lanka is currently facing in ODI cricket. “Batting is the problem we are having mostly in the ODIs, not a single hundred this whole year by any player and we have scored 275 plus only four times and whenever we have done that we have won the match,” pointed out De Mel. “We have lost five wickets before 180 runs most of the time, and we are losing three wickets in the first 10 overs that is a problem. We have to improve on that,” De Mel emphasized. “The problem is when you don’t prepare good pitches. In New Zealand you see even after 70 overs the ball is still playing a bit, here we are preparing dust bowls. When you prepare dustbowls with balls basically coming along the ground then it is very difficult for the batsmen. We have to prepare good pitches if we are to give confidence to our batsmen otherwise they lose confidence,” he said. De Mel said that to fix the existing problem with the batting the selectors may even resort to making use of Test opener Dimuth Karunaratne. “We have upped Dimuth in the Test matches by making him the vice-captain we might even have him in the one-dayers because he is doing well in the Tests. “We are also keeping in mind Upul Tharanga we have not forgotten him. We don’t want to overlook him. Then there is (Niroshan) Dickwella, (Danushka) Gunathilaka and Kusal Perera. We have plenty of opening batsmen to look at. (Lahiru) Thirimanne can also be looked at he is also a good player. We have to make sure we pick the right horse for the right course,” he said. The chief selector praised the performance of former captain Angelo Mathews in the first Test against New Zealand which Sri Lanka managed to draw at Wellington. “Mathews’ motivation is good the way he batted after we had lost 3 wickets for 19 in the first innings and in the second innings with Kusal Mendis. For some reason they dropped him saying he was running out his partners and all that. For him to run out his partner, the partner also must know how to run,” said De Mel. “Dropping him from the ODIs and playing him in the Test matches does not make any sense. He has scored the most number of runs in ODIs. We have told Mathews that he should bowl in the ODI series not the full quota of 10 overs but at least five for it helps to get our balance right,” he said. A positive indication that Mathews was gearing up for that role was witnessed during the first Test against New Zealand where he bowled four overs for one run. One thing is guaranteed with the De Mel-led selection committee - the national team won’t be carrying any passengers in future squads. “The first thing they have to pass is their fitness levels required by the time standards given. Certain skinfolds and yo-yo (running) tests have to be done if they don’t pass them we don’t select. The players all selected have passed their levels of fitness that is required by Sri Lanka cricket standards,” said De Mel.